One hundred buckaroos might seem like a lot of green but when it is spent on Madman's blu ray release of CLAMP's Tsubasa Chronicles: Complete Memories Collection, it's an investment. Let's look at it this way, if you buy a new film on blu ray you're looking at around $35 for 2 hours of fun. For just under 3 times that amount you get 8 discs and 24.6667 hours worth of pure, limited edition anime goodness. "A true and noble heart holds much power, stronger than the hardest fist and mightier than the most potent magic. Four disparate travelers begin an epic journey; their goals different, their destiny the same. Along the way, the past will meet the future in the present. Of all the paths of every life, mingling in the dimension between dimensions where a foe has the face of an ally, and an ally the face of a monster. 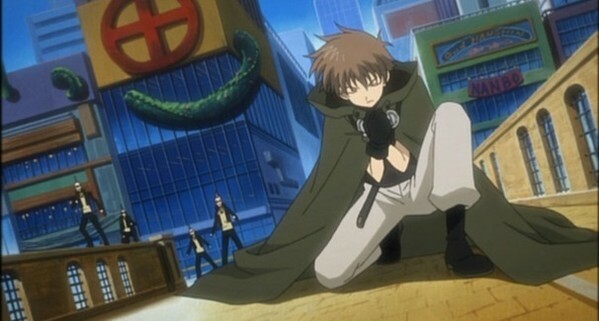 At the center of this heroic undertaking is Syaoran, a young man called upon to save his fated, the princess Sakura. Her memory has been shattered, the very essence of her soul sent adrift across the universe. Feathers float down on strange lands, torn asunder if only to prove the power of love. 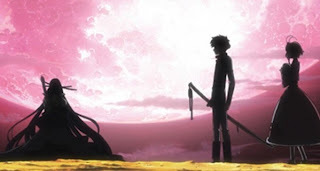 With fellow travelers Kurogane and Fai, a warrior and a wizard, an epic quest begins. One of danger and mystery... The possibilities are endless. This collection contains both seasons 1 and 2 (episodes 1-52) of Tsubasa, RESERVoir CHRoNiCLE plus The Princess in the Birdcage Kingdom movie." I'll admit that I was pretty confused when watching Tsubasa Chronicle. It's a universe that I was previously unacquainted with. This is the same universe as CLAMP's other works including Cardcaptor Sakura and xxxHolic. Unfortunately I haven't managed to watch or read either of those. That said, it didn't take long at all to be drawn into what is and incredibly rich world. I found that the depth of history and character was especially engaging, even though the plot had a tendency to creep along. One of the downsides of the series is the slow progression of the series although it also helped to thoroughly flesh out the characters instead of glossing straight by them. The animation, supplied by Bee Train (Madlax, Blade of the Immortal), is probably best described as elegant shonen. They managed to interpret CLAMP's bolder style without losing the aforementioned elegance. It is important to note the difference in art style as this was CLAMP's first foray into the shonen world and their art style was altered to suit more masculine tastes. I think this is what has made Tsubasa Chronicles so enduring. Director Koichi Mashimo used CLAMP's genre bending art style while infusing their shojo sensibilities, making for a series that is can be enjoyed by anybody. It makes Tsubasa Chronicles difficult to pigeon hole but easy to love. I was a little disappointed by the use of static characters during battle sequences where static images of the character would float by an animated background. It felt like it was an easy way out and below Bee Train's usual standard. Also included in this release are the OVA series and feature film with animation supplied by Production I.G. Need I say more? One massive highlight of the series is the incredibly beautiful score which was composed by Yuki Kajiura of Fate/Say and Pandora Hearts fame. Not only is the score one of the best I've ever heard but it benefits greatly from the blu ray HD release. Crisp and sharp it flows from drama to whimsy and brings the whole series together. The sign of a top quality score. There aren't many series that I insist on watching the opening and ending sequences but this is one of them. The only others that I can think of are FLCL and K-On! which are both rock/pop soundtracks and completely different to anything that you will hear throughout all 56 episodes of Tsubasa. The biggest complaint that I have about Tsubasa Chronicles is its pacing, something that Bee Train have been criticised for in the past. The first half of the first season does seem to drag on but not without good reason. I feel as though the pacing was deliberate and helped to give character and story arc introductions the attention that they deserved. If you are looking for a hack and slash action fest, perhaps you're best skipping this series. In fact, you're probably best off skipping the majority of CLAMP's series'. 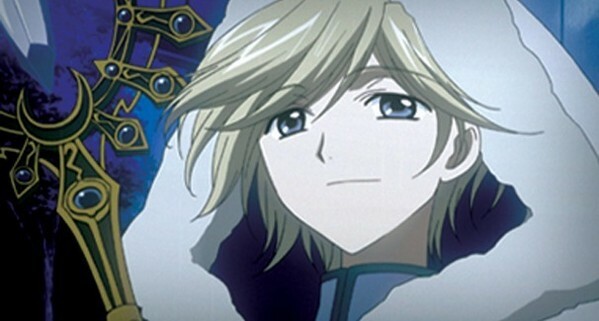 Those who are fans of CLAMP's work will be thrilled with Tsubasa and will probably already have seen it. 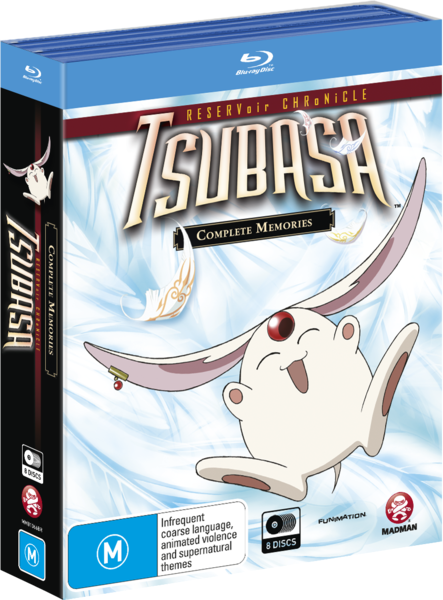 If you're looking for a series that you can really sink your teeth into, pick up the Tsubasa Chronicles Complete Memories Collection from Madman. It is a great series full of great characters and a universe that left me wanting more, I will definitely be tracking down more of CLAMP's works. At only $100 bucks it is an absolute bargain but from what I've been told, it is in limited stock. So get in quick! 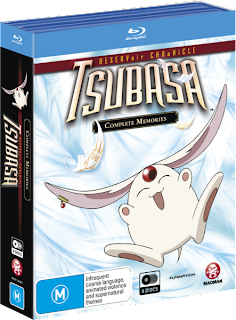 Tsubasa Chronicles Complete Memories Collection is available from Madman on Blu Ray now! If you miss out or would prefer DVD, you can still get season one, season two and the OVA collection on DVD.